Researchers at the federal technology institute ETH Zurich have developed a way of producing body parts containing cartilage, with the help of a 3D printer. One of the first practical applications of this method is reconstructive surgery. Damaged body parts, like a nose or an ear, can be rebuilt in a computer 3D model. Cartilage cells are thenremoved through a biopsy. In the laboratory these cells are cultivated and mixed with a biopolymer which is used as a shaping mould. From this body parts can then be shaped with a 3D printer. The reconstructed body part is then ready to be transplanted into the body. 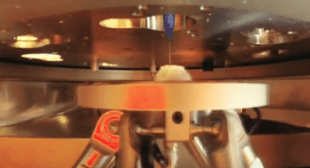 Bioprinting advancing again and again! Bioprinting World is your source for bio-printing info and videos. Discover how 3d printing technology is used in human tissue engineering for medical research and therapeutic applications. The 3d printer is optimized with biomaterial to be able to print skin tissues, heart tissue, and blood vessels among other basic tissues. What is bioprinting? What is bio-ink? Learn about 3d printed prosthetics, human organs, surgical therapy, and how bioprinting will change the pharmaceutical and medical industry. Bioprinting is a new area of research and engineering that involves printing devices that deposit biological material. The long-term goal is that the technology could be used to create replacement organs or even entire organisms from raw biological materials. Cardiovascular scientists have announced that it will be possible to 3D print a whole heart from the patients’ own cells within a decade. A bioengineer has been quoted saying that the heart is one of the easiest organs to bioprint. In fact, scientists have already bioengineered a coronary artery and printed the smallest blood vessels in the heart used in microcirculation. But while 3D printing holds promise for patients, it poses immense challenges for regulators, who must assess how to—or whether to—regulate the burgeoning sector. In a recent FDA Voice blog posting, FDA regulators noted that 3D-printed medical devices have already been used in FDA-cleared clinical interventions, and that it expects more devices to emerge in the future. Much of the debate on the FDA s effectiveness will continue on on bioprinting websites.